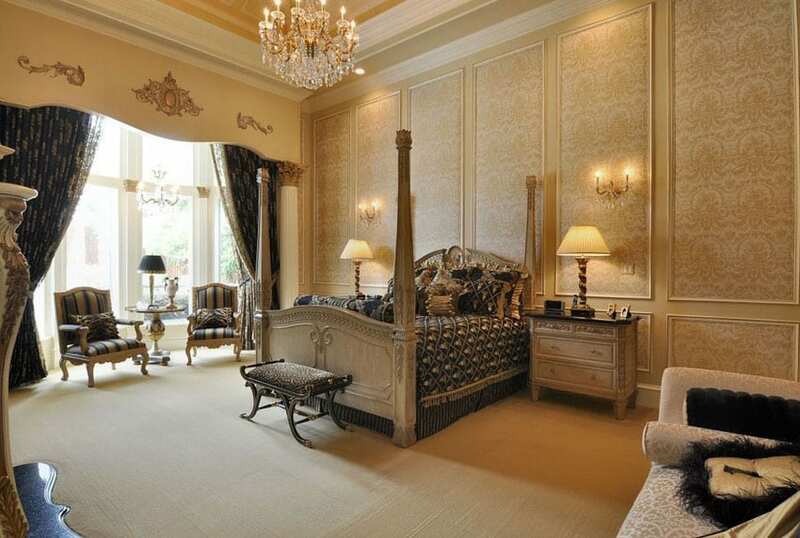 Welcome to our gallery of gorgeous luxury french provincial bedrooms. This French Country inspired interior design style traditionally uses soft colors with antique and vintage furnishings from the time period. French provincial bedroom designs are elegant and are widely re-interpreted around the world to combine contemporary materials with old-world charm. The French Provincial style is believed to have started with wealthy French landowners in the 17th through early 18th centuries. The style is generally thought of as a combination of rural influences paired with the Parisian design style. 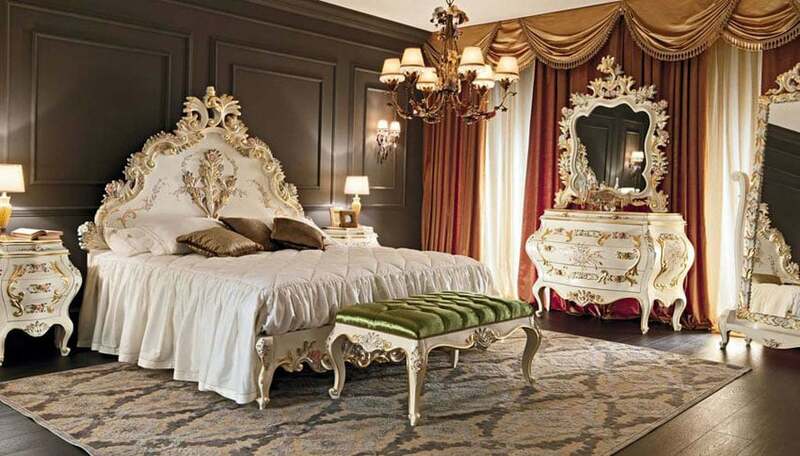 Below are some beautiful pictures of French Provincial bedroom ideas you can use to add this style to your own home. French provincial bedrooms are often recreated using contemporary furnishings with eye pleasing results. In the picture above the four-poster bed with intricate vine detail almost looks like it came from a fantasy model, and is matched by silver-gilt bedside tables and a curved bench at the foot of the bed. The recessed ceiling is given more height with its cove lighting and culminates in a splayed silver candelabra. A classic silver dressing table faces a series of floor to ceiling windows, outfitted with sheer lace curtains and draped valance curtains. 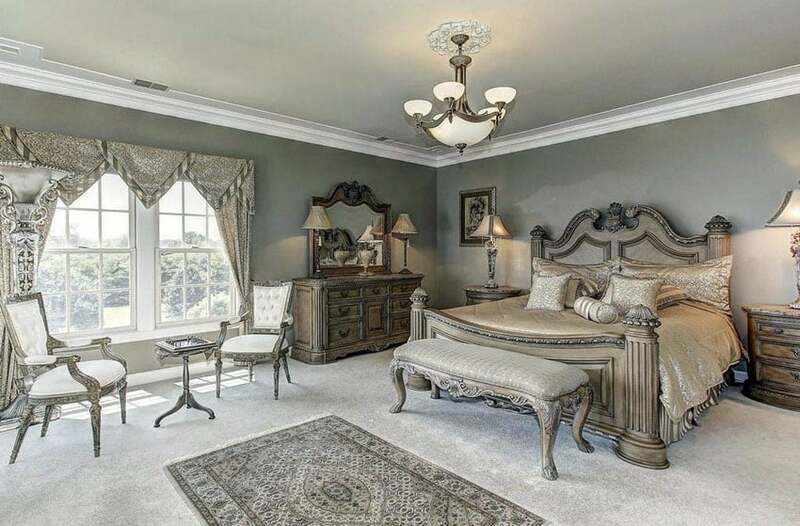 French provincial bedrooms are well known for their elegance and sense of sophistication. In the picture above, with gilded golden accents for the bed frame, wall-mounted candelabras, and the ornate bedside mirrors, this bedroom is an example of the French Marie Antoinette style. Subdued by plain white sheets, armchair and sofa set, as well as a taupe-colored area rug, this bedroom is a showcase of luxury without going over the top with its elements. A fireplace by the foot of the bed provides not only good heating, but can be used as an accent, especially with a plate rail on top. Warm wooden strip flooring give this royal-looking room a sense of comfort. Instead of using gold accents typical to old French royalty, this bedroom throws in a modern aesthetic by using a lot of black in its accent décor. 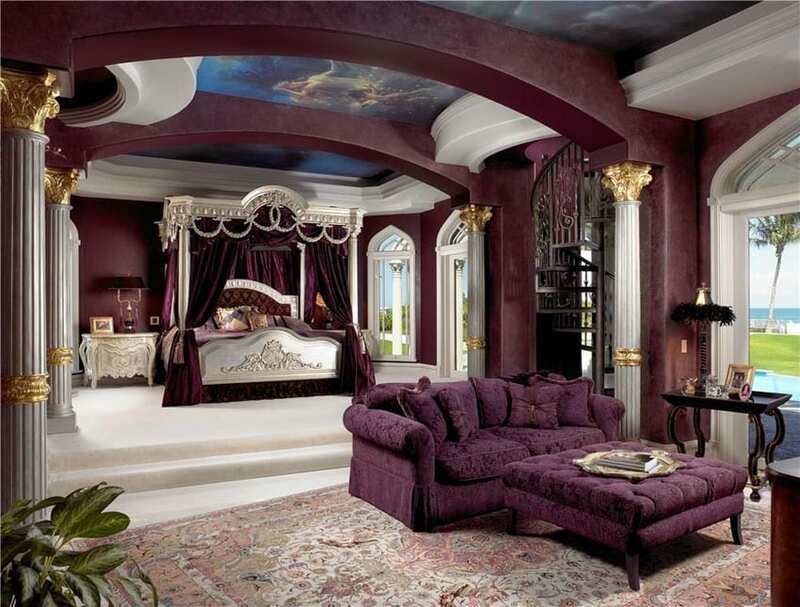 It also uses a dark-colored chandelier as centerpiece, to balance off the whiteness of the floors, walls and bedsheets. The heavy Louis XIV bed in upholstered leather is softened by double French doors on either side leading out onto a terrace. Classical leaf motifs on the paneled walls as well as a fireplace by the side of the room give this room an authentic Old World elegance. Separated by a fireplace beneath a silver gilded mirror, this room features a four-poster bed in embellished white wood, and a day bed with comfortable gold threaded throw pillows. The room’s vaulted ceilings and large-cut tiled flooring with white borders emphasize the large space, as does the use of multiple mirrors. A light flower branch design was used for the wallpaper and matches with the rustic crystal chandelier. The Rococo-styled furniture, with its emphasis on comfort and cushioning is apparent in the repeated upholstery works, as well as the curved leg bureau to the side. The style is further emphasized by the curling candelabra in the center, but is muted by the modern glass and steel coffee table and plain area rug. The light-colored room is given weight by its dark violet-colored walls and dark wood panel flooring. Whimsical gold pediments on thin fluted columns hold up the purple arched beams of this French bedroom. A two-step threshold to the gilded four-poster bed with matching purple curtains, ogee-shaped arched windows and frescoed ceilings make this bedroom fit for royalty. A winding wrought iron spiral staircase and Moroccan rug under the Ottoman style furniture lend an air of mystique to this Louis XV styled bedroom. Hints of pale China blue are found in this room’s draperies, bedsheets, bench and leaf-patterned rug. The heavy double-layered bed with matching bench at the foot of the bed as well as the classic mantelpiece over the fireplace is softened by the large bay window, with its base made of white lattice work. The dressing table in front of the bay windows, framed by two small lampshades and an upholstered chair give the room an unabashed chicness, as does the leopard-print foot stool. With sliding glass doors leading out to a beautiful outdoor terrace, the interiors of this room are hinged on the gold-gilded candelabra with hanging crystals over a marble console table, placed at the foot of a robust white linen bed. Tropical prints on the curtains, framed by a corniced window valance, lend this bedroom a classic laidback feel alongside its classic, heavy French furniture. A four-poster bed complete with hanging curtains is given depth with the double armchair and ottoman set topped with a candle-lamp chandelier. Emphasized by the patterned rug flooring and double French doors leading out to a balcony, this room all-white room is accented by the dark wood bureau to the side of the bed. The dark green lampshade, potted plant and dark gold framed painting give this accent piece more weight. A double-recessed ceiling with pastel frescoes emphasizes the metal and glass pendant lamp that hangs over the console table at the foot of the bed. The bed, simple in its beige and white sheets and unadorned wooden framing speaks the clean lines and casual rustic emphasized by the Louis XVI style. The plain wood bureau and accent chair against the wall opposite the bed also speak a rustic elegant style, and is further emphasized by the plain beige rug flooring. Pastel blue walls and white and blue curtains give this room a mild accent and further emphasizes the craftsmanship of the woodwork. This large bedroom is divided into different spaces including the main bed with its fluffy silk sheets and headboard, the day bed and its simple brown color, and a bay window to the far end with a patterned window valance. The wrought iron grille in front of the fireplace provides a classic touch to the modernity the recessed flat screen TV brings to the room. The whole room is painted in a textured, pearlescent beige, echoed by the centerpiece chandelier and patterned rug. The beautiful blues of the outdoor lake is brought inside by the deep yet small blue accents on the candelabra. A series of picture windows and double French doors leading to the balcony is unobstructed in view, with only plain white curtains to frame it. All-white wood furniture are given a softness with rich bedsheets and upholstery, and are emphasized by the dark wood flooring. Having the walls painted in a pale yellow color is a subtle nod to its color contrast with the chandelier’s blue accent. French Provincial bedrooms are known for their quality handmade decorative furniture and use of linen, cotton woven wool fabrics, curtains and rugs. This room represents them well with a heavy Sun King styled four-poster bed gilded with leaf motifs is flanked by two matching gold-gilt bedside tables with luxurious lampshades and gold-gilt mirrors. A Moroccan-style area rug runs from the centerline of the bed until almost the end wall opposite from it, providing a sitting space at the foot of the bed and giving the room depth and a level of exotic elements. A pair of French doors leading to the balcony bring in some natural lights amidst the yellow glow of the crystal chandelier. Contemporary plaster-cast animal heads and a human head coffee table are quirky additions to this classic black and white bedroom. The black wood bed frame, wardrobe and strip flooring are lightened by the pinstripe white and pastel mint walls. Further, lightness is brought into the room with hexagonal coffered ceilings and a many-tiered chandelier at its center. The contemporary safari theme is further emphasized by the matching silver framed zebra skin upholstery of the chairs by the Oriel window on the far side of the room. Warm golden hues fill this room with its lighting starting with the gold crystal chandelier, matched by the wall sconces and twin lampshades. French style gold patterned panel walls emphasize the warmth of this room, as does the light wooden four-poster bed and side tables. Dark, heavy Louis XIV accents are found in the sitting area by the window, the heavy floor to ceiling curtains and the bedsheets. Classic Louis XIV style furniture is given a Contemporary twist using the black and white scheme. 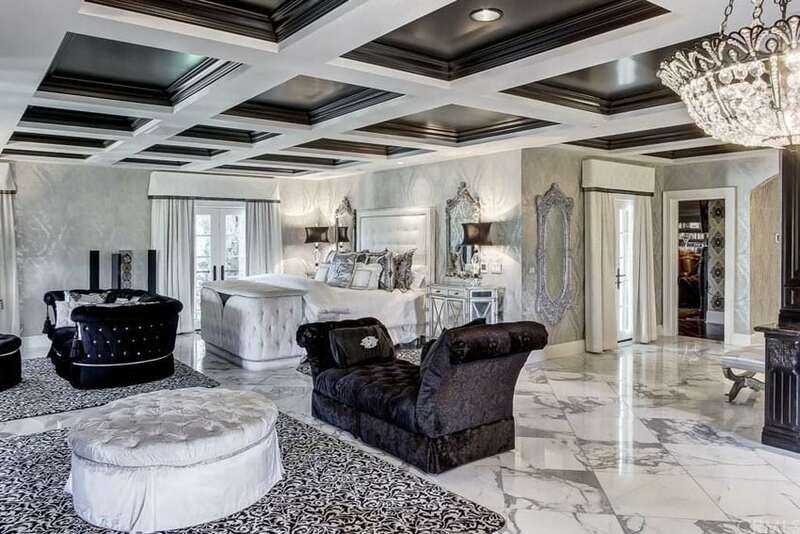 Coffered black ceilings and a white framing provide a sense of structure amidst the randomness of the Calacatta marble tiled floors and opalescent patterned wallpaper. Comfort and style come together with the rest of the furniture, all upholstered with buttons, in either black or white, using leather or suede, giving the room a bit of a gentleman’s touch. The simple wood paneled walls give this Madame Pompadour inspired room some relief amidst heavy maroon draperies with a gold and tasseled valance. Simple dark wooden floors also provide balance with the patterned area rug and Rococo white and gold furniture featuring curved lines and intricate carvings. A muted bronze lampshade chandelier ties together the entire room’s combination of dark wood and clean white mixed with gold. A subtle yellow-light cove light illuminates the room’s recessed ceiling and puts attention on the antique gold chandelier at its center. The white upholstered and gold-gilt bed and bench combination with their matching button tufted white leather cushions are in the Marie Antoinette style, the precursor to un-distracted elegance. The white textured rug and double armchair set with ottoman further emphasize the comfort aspect of the style and pale mint window treatments emphasize the greenery outside of the white mullioned windows. The richly decorated white ceiling is emphasized by the silver crystal chandelier and the rosette at its base. Divided into several areas, this large bedroom’s main focal point is the gold and white tufted leather bed, accented by the pale blue armchair and sofa set at its opposite end, centering a Contemporary style thin gold metal and glass coffee table. The sitting area to one corner is separated by an arched architrave held up by a classic plastered column, and given depth by its wooden built-in shelves. The walk in closet right behind it is also grounded using the heavy wooden wardrobe. Faded silver accents are the main color point in this room, from its bedframe, bench and the tones of its pendant lamp and lampshades. The cool silver tones are emphasized by the gray walls and white patterned rug. A small Moroccan style rug and large white mullioned windows provide a hint of warmth in this classic French bedroom. Accents in this room stand out in royal purple, coming from its throw pillows and drapery behind the white cushioned, gold-framed bed. A classic fireplace and mantelpiece by the foot of the bed are emphasized with scroll-shaped brackets and sun motifs, and large floor to ceiling windows framed by heavy cream-colored drapery provide a natural outdoors feel. 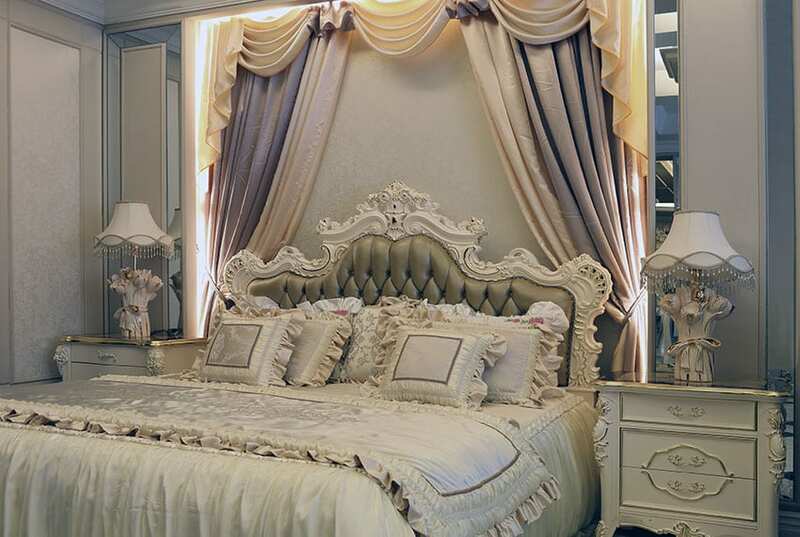 Featuring many boxy, throne-like furniture pieces, this bedroom is unabashedly Louis XIV in style and the dim yellow lighting from the crystal candelabra further emphasize this feel. The heavy bedframe is made heavier with large silk throw pillows and framed by a pair of gilded mirrors over warm wood bureaus topped with classic jar-held lampshades. The upholstered stools at the foot of the bench further emphasize this French luxe feel, as does the large meeting table with squat armchairs. The floor to ceiling windows at the end of the room are framed by draped curtains under some draped valances. Gold lines separate plain white panels in this bedroom’s walls and ceiling. Light wooden strips make up the flooring, lending a Contemporary feel to this Louis XIV inspired bedroom, with its heavy furniture and accent piece textiles, apparent in the rich-textured bed with matching bench. The heavy marbled wood console at the front of the bed opposes the modernity of the recessed flat screen TV, and is accompanied by a pair of lampshade wall sconces. 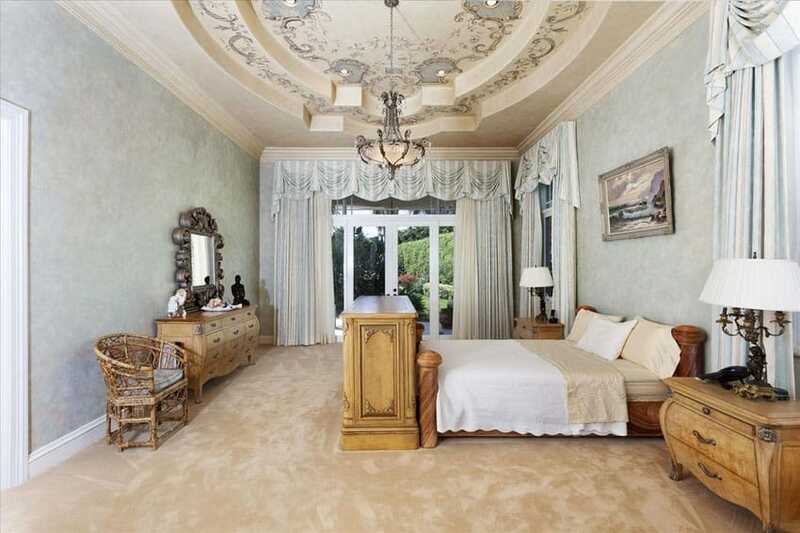 An Arabesque rug beneath the bed further emphasizes the Classic feel of this bedroom. Circular coffered ceilings inlaid with leaf motifs in a golden paint and a warm brown base give this classic French bedroom an Arabesque twist. 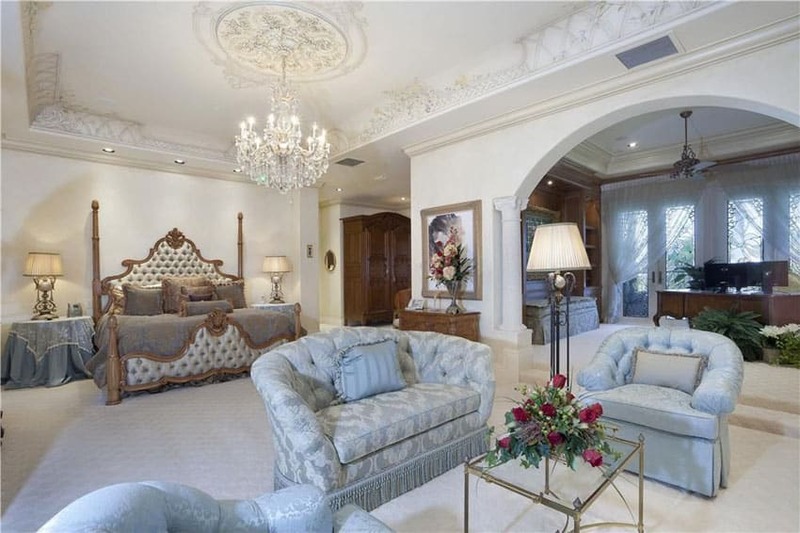 The tufted paneled wall on top of the bed is emphasized by a gilded frieze on top and fluted pilasters on either side, framing the bed that has been topped with patterned throw pillows and opalescent brown sheets. Across the bed is a recessed display shelf, with the bottom panels embossed with tiny rosettes. The far wall features a three-sided floor to ceiling window complete with Louis XIV armchairs and coffee table, and two slim bronze mirrors hang by the other arched window. 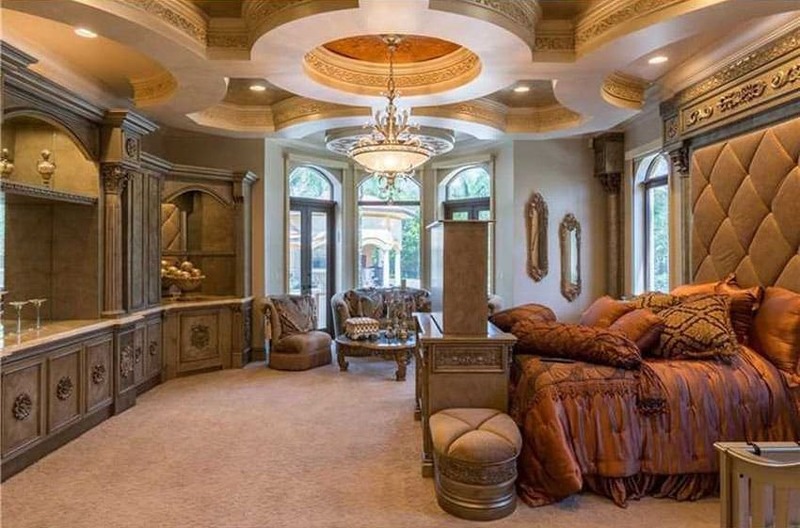 This luxury Parisian style bedroom is loaded with romance. From its flowing bed curtains, tufted headboard and decorative antique reproduction night stands to its whimsical night lamps with beaded shades it provides a relaxing and elegant environment. The bed is decorated in muted colors with a lot of lace and woven fabrics that are reminiscent of French Provincial bedrooms. This beautiful French provincial bedroom design features an alluring gold gilded bed frame and head board. The room decor offers an abundance of designer furnishings such as the chaise lounge, coffee table, love seat and end tables. French doors open up to a backyard patio for a morning coffee escape. Bright wooden strip flooring tones down this gold-themed French bedroom. 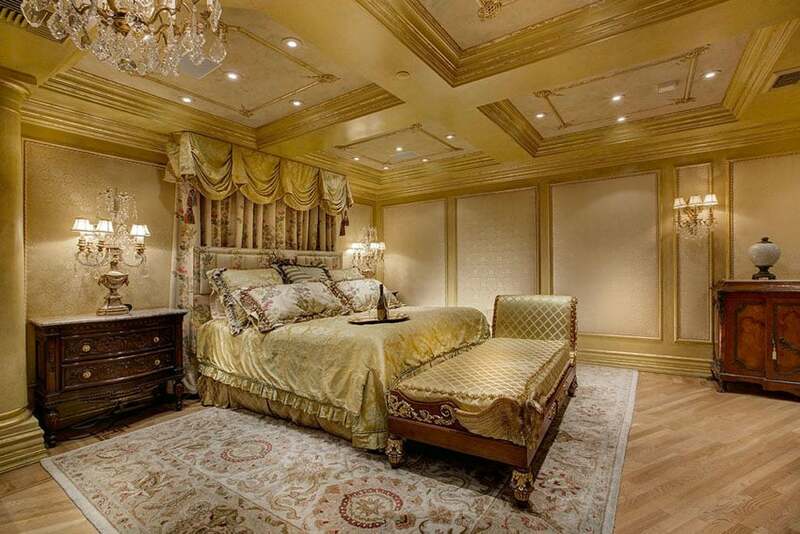 Gold is the main color of choice, and positioned against swathes of white on its coffered ceilings, patterned wall panels and on the room’s choice of bed sheets and upholstery. Rich wooden furniture like the bench frame and the bureau give the room a natural texture, while the flower themes in the curtains and area rug provide a sense of exoticism.